There’s no escaping the fact that Richard Strauss’ frothy opera “Ariadne auf Naxos” is a stylistic mishmash. 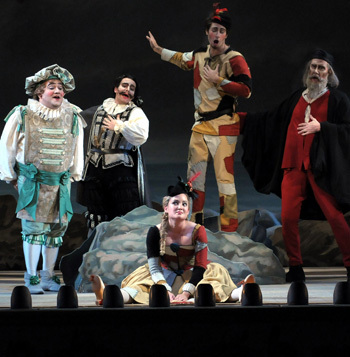 It’s commedia dell’arte meets the Marx Brothers, lovable but seriously bizarre. Strauss and librettist Hugo von Hofmannsthal knew what they were about in contriving this madcap adventure that begins firmly in comedy and ends up with both feet planted in the ardently romantic world of “Tristan und Isolde.” It is, shall we say, what it is, and the Lyric Opera of Chicago has connected the scattered dots of “Ariadne” with equal parts of zeal and flair to create a delightful entertainment far from the beaten path. 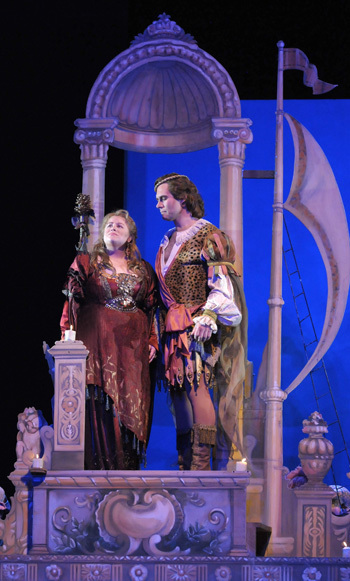 The gist of “Ariadne” is that in 17th century Vienna, a wealthy aristocrat is throwing a party highlighted by a double bill of theater: a farce by a commedia dell’arte troupe and an operatic tragedy, all to be followed by grand fireworks. But when time runs short, the patron orders the two shows to be performed simultaneously, leaving it to the entertainers to deal with any inconveniences. While the composer of the new tragedy and his prima donna are appalled, the vivacious and practical-minded comedienne of the opposite band sees no problem: Her team will simply jump into the opera where they can and improvise. The title “Ariadne auf Naxos” is drawn from the tragedy within Strauss’ opera – the Greek myth about the beautiful Ariadne, abandoned on the island of Naxos by the false-hearted Theseus only to be rescued and translated into a constellation by the god Bacchus. Strauss and Hofmannsthal used a novel blueprint: a Prologue (the backstage preparations by the two acting companies ending with the pronouncement that the two shows must run together) and the Opera (the farcically beset tragedy, which well might have inspired the Marx Brothers’ wacky film “Animal Crackers”). For all its theatrical scramble, “Ariadne auf Naxos” remains a cornucopia of musical splendors, both orchestral and vocal. The Prologue, with its posturing and anxiety and confusion, makes for very funny theater. It also affords a vocal showcase for two classic and wonderfully appealing characters, the youthful, exasperated Composer and the comedy troupe’s saucy star Zerbinetta. In one of opera’s most famous trouser roles, mezzo-soprano Alice Coote is a thoroughly credible Composer, serious and proud of what he has wrought, then crushed to despair at the prospect of seeing his great work trivialized by this ridiculous fusion with comedy. When irresistible Zerbinetta restores his faith, the Composer pours out his newfound pride and confidence in a ringing, radiant testament. 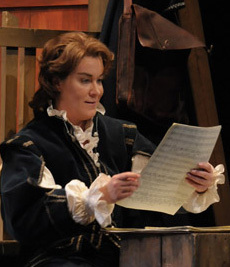 Coote filled that aria, “Musik ist eine heilige Kunst,” with its full measure of heart and vocal passion. Soprano Amber Wagner’s Ariadne was, first of all, hysterically funny as the haughty backstage prima donna sailing about in high dudgeon with cold cream on her face. In her formidable Opera assignment — where the bereft Ariadne sings of her heartbreak to the breeze, the gods and the comedians (!) — Wagner got past some opening-night uneasiness to display a full, rich sound that made one forget the nutty stuff that drew raucous laughter in the midst of her misery. But it was the late-arriving Bacchus who brought with him, on the voice of tenor Brandon Jovanovich, the evening’s most memorable singing. I heard him last summer as Siegmund in Wagner’s “Die Walküre” at the San Francisco Opera, and again took great pleasure in a heroic sound that can also achieve fine gradients of tenderness. Hats off as well to conductor Sir Andrew Davis for musical leadership that was animated, expansive and majestic, stage director Jon Cox for the “Noises Off” slapstick spirit of the Prologue and the convulsively crazy business that spiced the Opera, and set designer Robert Perdziola for his cleverly detailed backstage. I’m not sure “Ariadne auf Naxos” actually works. But then again neither does “Animal Crackers.” So I’m left in completely irrational agreement with the guy sitting behind me. “I love this opera,” he said. The whole, well, supra-rational explanation can be found in this infectious night at the Lyric.